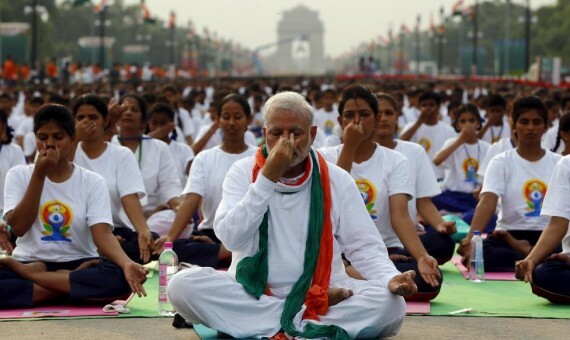 From the Himalayan region of Ladakh to the deck of an aircraft carrier, tens of thousands joined Indian Prime Minister Narendra Modi on Thursday to celebrate the fourth International Day of Yoga, with a few wearing masks to highlight poor air quality. Modi pushed for the annual event to be held worldwide after winning power in 2014, with the lifestyle industry centered on the ancient physical and spiritual discipline estimated to be worth around $80 billion. Pictures on social media showed participants braved rising mercury levels and unhealthy air quality in some places to spotlight yoga, India’s cultural export to the world. In India, more than 50,000 people joined Modi in performing yoga in the lawns of Dehradun’s Forest Research Institute, in the Himalayan foothills of the northern state of Uttarakhand. About 7 million people die each year from breathing polluted air that can lead to heart disease, stroke and lung cancer, the World Health Organization said in a report last month, most of the deaths happening in Asia and Africa. India was home to the world’s 14 most polluted cities, with New Delhi, the capital, ranked sixth most polluted, it added. Delhi’s air quality has improved from the hazardous levels it hit last week, but still ranges around 200 to 400 micrograms per cubic meter, or roughly three to six times the safe level, government data show. Some participants wore masks to highlight the alarming quality of the air, which has worsened during recent winters, prompting Modi’s office to directly monitor cleanup measures in New Delhi. Yoga guru Baba Ramdev led a gathering in the western state of Rajasthan, whose chief minister said it was the largest group yoga event. Troops guarding the world’s highest battleground on the Siachen glacier, in the Ladakh region of northern Jammu and Kashmir state, did yoga routines at an altitude of around 18,000 feet (5,486 m). The Indian navy also released pictures of sailors doing yoga on board the world’s oldest aircraft carrier, the INS Viraat, decommissioned last year.